This week's Maitri Tunes is a heartfelt celebration of the love story of Rama and Sita sung by Catherine, a dear sister from Canada. The accompanying story is a testament to the fact that in life it is the small things we do with great love that truly matter in the end. This is a story from the Ramayana, the ancient Hindu epic poem of India, which narrates the struggle of the divine prince Sri Rama to rescue his wife Sita from the demon king Ravana. Long ago in ancient India a ten-headed monster called Ravana the Rakshasa kidnapped a king’s beloved wife. The king was named Sri (Lord) Rama and his queen was named Sita. Everyone loved the king and queen because their hearts were pure. Sri Rama set off to rescue his wife with the Prime Minister of the Monkey King, Sri Hanuman, leading an army of monkeys. They traveled until they came to a vast sea that they would have to cross to reach Ravana’s kingdom. 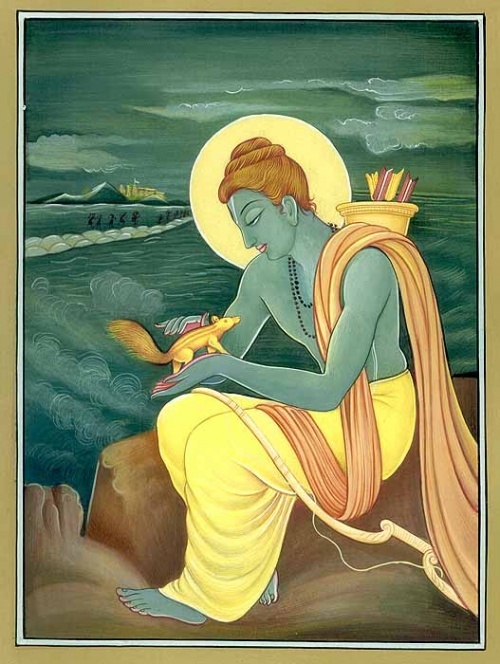 Sri Rama attempted to calm the raging ocean by shooting his magic arrows into the waves. But the King of the Sea rose up and said, “The seas cannot be overcome by force, but only by building a strong bridge.” So, Sri Rama ordered the monkeys to construct a stone bridge that could hold his entire invading army. Monkey after monkey set to work carrying huge stones and enormous boulders to the seaside. Thousands of monkeys worked ceaselessly and Sri Rama was pleased. Then the king noticed that a small brown squirrel rushed up and down from the hills to the shore carrying little pebbles in her mouth. “What is that little creature doing?” he wondered. The little squirrel looked up and said, “I am helping to build the bridge to save Queen Sita.” All the monkeys began to laugh. They held their sides and roared and hopped and mocked the little squirrel. “We have never heard anything so foolish in our entire lives,” they said. The monkeys moved the squirrel away, but she continued to carry small pebbles and pile them up nearby. Finally, one monkey grew so irritated that he lifted the little animal and threw her into the air. The squirrel cried out, “Rama!” The lord lifted his hand and caught the squirrel safely in his palm. It was just at that moment that the monkeys realized they needed the little pebbles to place between the larger stones to keep the bridge from falling. Lord Rama said to them, “Monkeys, never despise the weak or the deeds of those that are not as strong as you. Each serves according to his strength and capacities and each is needed to make this bridge.” With three fingers, Sri Rama drew three lines down the squirrel’s back. “What truly matters is not the strength one has, but how great one’s love and devotion is.” From that day forth squirrels have had three pale stripes on their rich brown furry backs—marks of the great Sri Rama. And that is how the strongest bridge across the sea was built. Besides being a gifted singer, Catherine also knits prayer shawls along with a small group of friends and sends them out to folks in need of healing. Here is a story of how she moved a friend to tears with her prayerful gift.